When America faced its greatest internal crisis, Michigan answered the call with over ninety thousand troops. The story of that sacrifice is preserved in the state's rich collection of Civil War monuments, markers, forts, cemeteries, reenactments, museums and exhibits. Discover how General George A. Custer and the famed Michigan Cavalry Brigade "saved the Union." Visit the chair that President Lincoln was assassinated in at Ford's Theatre, and view the grave of the last African American Union veteran. 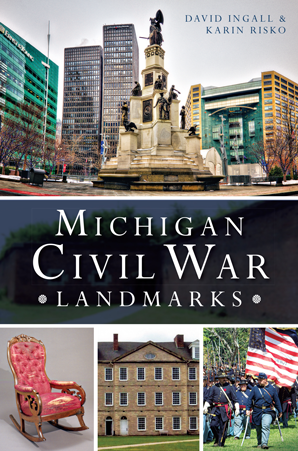 With a foreword by Civil War historian Jack Dempsey, this work is the first of its kind to chronicle the many Civil War landmarks in the Wolverine State. Karin Risko is the founder of Hometown History Tours, a local tour company that shows off the rich history of Detroit and southeast Michigan, including its Civil War history. A member of the Detroit Metro Convention and Visitors Bureau, Karin is frequently called upon by local professional and social organizations to speak on local history and tourism. She earned a BS in secondary education with a major in history from Central Michigan University. Karin lives in Grosse Ile. David Ingall is the former assistant director of the Monroe County Historical Museum and was the chairman of the dedication ceremony of the Monroe County Civil War Soldier's Fallen Monument. He is a sought-after Civil War speaker and tour guide, member of the Civil War Trust, Monroe County Civil War Round Table, Little Big Horn Associates, Custer Battlefield Historical and Museum Association, and Custer Battlefield Preservation Committee. David is a graduate of Western Michigan University.